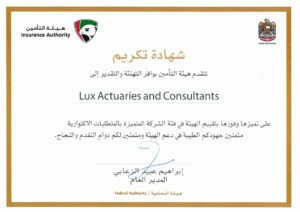 Lux Actuaries & Consultants is proud to be re-awarded as the 2018 “Most Distinguished Actuarial Services Company” by the UAE Insurance Authority at the recent UAE National Day celebrations in Abu Dhabi. Lux was previously awarded this title in 2017. This achievement is testament to the strength and quality of the Lux team who strive to maintain our international service standards. Our core belief of investment in quality service delivery of actuarial best practices to our local client base is the source of our continued success. Well done to the Lux UAE team for their outstanding success!